Focusing Lenses feature anti-reflection coating. Offered in both Plano Convex and Meniscus styles, Focusing Lenses have anti-reflection coating with absorption rates as low as 18%, allowing lenses to retain less heat and last longer. Various diameters and thicknesses are available. 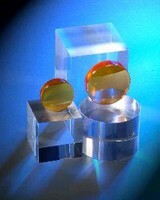 ATTC has introduced a new line of anti-reflection coating for their focusing lenses. The coating achieves absorption rates as low as 18%, the lowered absorption rate allows the lens to retain less heat which allows the lenses to run cooler and last longer. The line is available in both Plano Convex and Meniscus style and in many diameters and thicknesses.